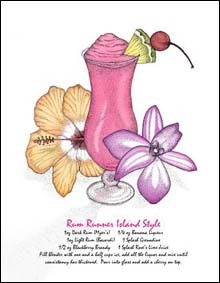 "Rum Runner Print with Recipe"
"Blue Crabs in Tropical Neon Colors"
A frozen tropical beverage is a great way relax on your Keys "Holiday". Kick off your flip-flops, sit back in the shade and order up a "Rum Runner." 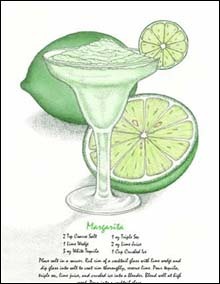 If Rum isn't your thing, head on down to "Margaritaville." After a few Tropical Cocktails you might catch the "Neon Blues", our version of Florida Keys Blue Crabs. Aaargh! Find your way to the Pirates Plunder...Follow the Map through the Caribbean Islands. "X" Marks the Spot where the treasure awaits..."Caribbean Pirate's Treasure Map"